As I write, it’s 6pm on Sunday night, after three days worth of storms have ripped through our state. I hear that there were more folks without power in Lexington than there were here in Louisville- almost three times as many. We were lucky. We only lost power for 3 hours or so Friday night, and while I drove home from a closing in the midst of a hail storm, having to pull over three times, I don’t see a single ding on my car. Saturday, driving home from the grocery store, we detoured down a few other streets in our neighborhood, and I almost cried. I knew the winds Friday night were terrible, and I knew the trees behind us were swaying enough to have me perched in the guest room, watching for any breakage, but I didn’t realize how narrowly we escaped severe damage. Just a block away, we saw not one but two homes with a tree through the middle of them. One had a root system that had pulled out of the ground bigger than my car. The owners were standing in the front yard, holding each other as emergency crews scrambled to cut the huge Oak into manageable pieces and tarp the gaping hole in the roof. It would storm again within the hour. I got home, unloaded groceries, threw together some vodka sauce and rigatoni, and opened Facebook. On a community page, neighbors were complaining about being without power, without internet, without phone service. All I could think of were our neighbors without a house. It’s thundering again now, and the rain has started to come down again- hard. I sat here, on Sunday- my favorite day of the week- in air conditioning, with something like the 8th cup of fresh French Press, binge watching the Venture Bros., planning a roast chicken for dinner, and heard my washer chiming away in the basement, signaling that a load of whites was done. It made me think about having to run into the basement to toss them into the dryer, to start another load, and being grossed out that I’m walking on a bare concrete floor, with spiderwebs and dust hanging from the floor joists above. I hate my basement. From the moment this house was bought, I’ve fantasized about finishing the lower level- built-in bookshelves, a huge combination laundry room and butler’s pantry… Truth be told, I had the wallpaper for the basement powder room purchased before we ever closed on the house. The same goes for our bathrooms upstairs. The one off the master still has a cherub-bedecked wallpaper border and yellowy faux-marble. 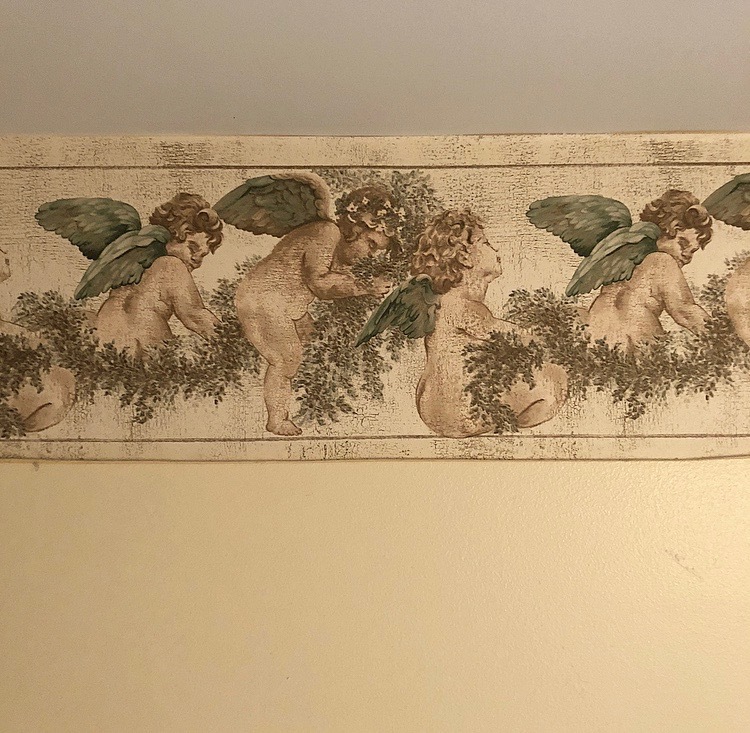 The cherubs bother me more than the color of the fake stone- it’s as if they stare at me when I shower. I can’t wait for the day to blow through the rear shower wall, building a huge walk-in shower, and putting down a lovely marble floor. The guest bath is just as bad, though without the cherubs. Yellow floor tile, a builder grade oak vanity, shiny brass fixtures. I know I can fit a soaking tub in there, perhaps a fancy stand-alone version that would photograph really well. Truth is, when the day comes for every room being complete, I know I’ll photograph it all, and show you. In the meantime, I stress over the yellow tile, the concrete floor, the bathroom cherubs. But, here’s the truth… there’s nothing wrong with my house. There’s no tree through my living room, no exposed wiring threatening to set fire in the rain that’s now coming down so hard. Home is where the heart is? Maybe. I think home is where there’s peace, where one can breathe, and feel safe. It doesn’t have to be- and it shouldn’t be- perfect at all times. These places we live…They don’t need to be social media perfect. There shouldn’t be pressure to document every lavish step of an 18-month mansion build on our Insta-stories. Home is where there’s peace, where there’s quiet. It doesn’t matter if there’s old Formica countertops and retro green and pink bathrooms. Home doesn’t have to be perfect enough to be in a magazine or featured on Pinterest. Home is where you’re comfortable, even with the cherub wallpaper. Home is where you’re safe from the storm.